OceanFit offers a number of advertising solutions for businesses and brands looking to target the lucrative ocean swimming market – fit, healthy adults who enjoy living an ocean lifestyle. Want to know more about our target market? We can paint you a picture of the typical ocean swimmer as defined by our 2015 & 2016 Annual Ocean Swimming Survey (n=1,800+). On top of the options below, we can work with you to tailor a promotion to match your objectives. We’re always looking for likeminded brands to partner with to take OceanFit to the next level. 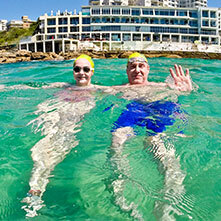 Grow with us as a valued partner and benefit from an association with Australia’s leading name in ocean swimming. Whether you’re large or small we can tailor a package that meets your needs. We are currently looking for corporate partners who will receive a customised package to suit their needs and partnership opportunites. Please contact us for more information. Our ocean swims calendar is fast becoming the calendar of choice for ocean swimmers and we have an opportunity for a corporate partner to be the premium sponsor of this section of the website. The partner will receive a header banner that is displayed on the ocean swims listing page and every event page within the calendar. This is a fantastic opportunity not to be missed! Please contact us for more information. In the lead-up to the 2016/17 ocean swimming season World Series Swims approached OceanFit to help promote two of their ocean swims; the Bondi to Bronte and the Noosa Summer Swim. We put together an integrated promotional package that included onsite advertising, featured event status, email campaigns, social media and advertorial content (in our blog). The result saw record numbers of participants in the Bondi to Bronte (24% increase YoY) and Noosa Summer Swim (7% increase YoY) and a very happy event organiser. OceanFit has made a big difference with our event campaigns this summer and the results at the Bondi to Bronte and Noosa Summer Swim Festival speak for themselves. It’s refreshing to see an ocean swimming platform working hard to introduce newcomers to the sport – events need this support to keep the industry moving forward. Prominent advertising spots that appear throughout the website. Spots are placed in the right hand column. Minimum two-week booking: Monday – Sunday. Feature your event inside our ocean swims calendar and ensure your swim is noticed! Banners appear in three locations within all individual ocean swim events (top, middle, bottom). Minimum two-week booking: 2 x Monday – Sunday. Purchase four weeks and get a FREE Small Rectangle in the right hand column, valued at $800! Throughout spring and summer we send out weekly eNewsletters to our large (4,500+) ocean swimming and lifestyle community and we enjoy a very engaging audience with a 35% open rate due to unique, interesting and informative content. Each email includes only one 300px x 250px advertisement (MREC) and these are $250/email. A single dedicated email for your event or brand is $1,000. If you send through product samples we will put together a product review in either an article or video format (or both), post it on the website and tell our community about it including how to purchase. If they’re products that we can use on a daily basis and we love them we’ll ensure we use them throughout summer in classes and at events. This is a contra arrangement and reviews are posted as fast as we can get to them. Product reviews with accompanying discounts for the OceanFit community are looked on favourably and will ensure greatest sales potential. Delivery address: PO Box 407 Bondi NSW 2026 | Courier address by request. Note, trial products will not be returned unless under special circumstances. We can promote your brand/product to our followers on Facebook, Twitter, Instagram, Google+ and Linkedin for $100/promo (maximum one per fortnight, each post must be different). We can help you put your promotional post together for greatest engagement, simply ask. OceanFit organizes a number of ocean swim events throughout the summer, including our popular OceanFit Kids Swim, and you can be a part of making them as fun and successful as possible! There are financial and product sponsorships available. Please contact us for more information about our advertising options.